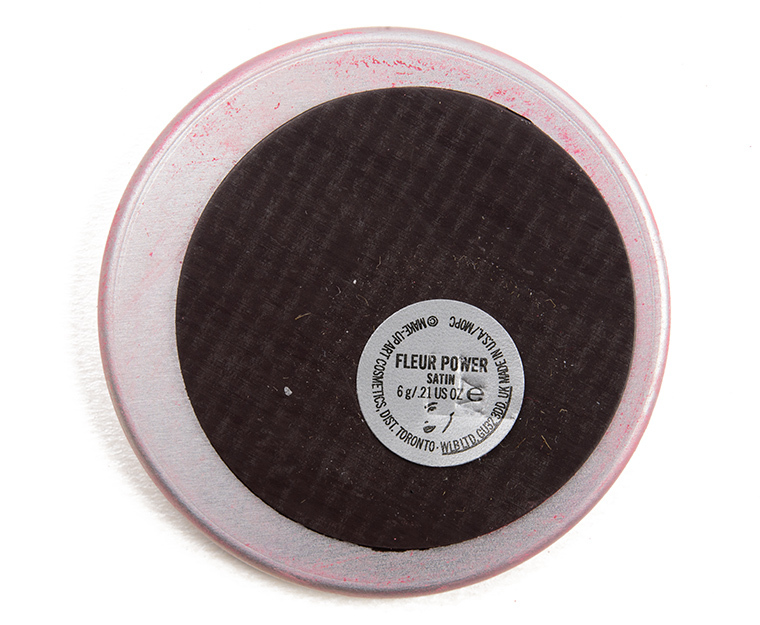 MAC Fleur Power Powder Blush ($24.00 for 0.21 oz.) 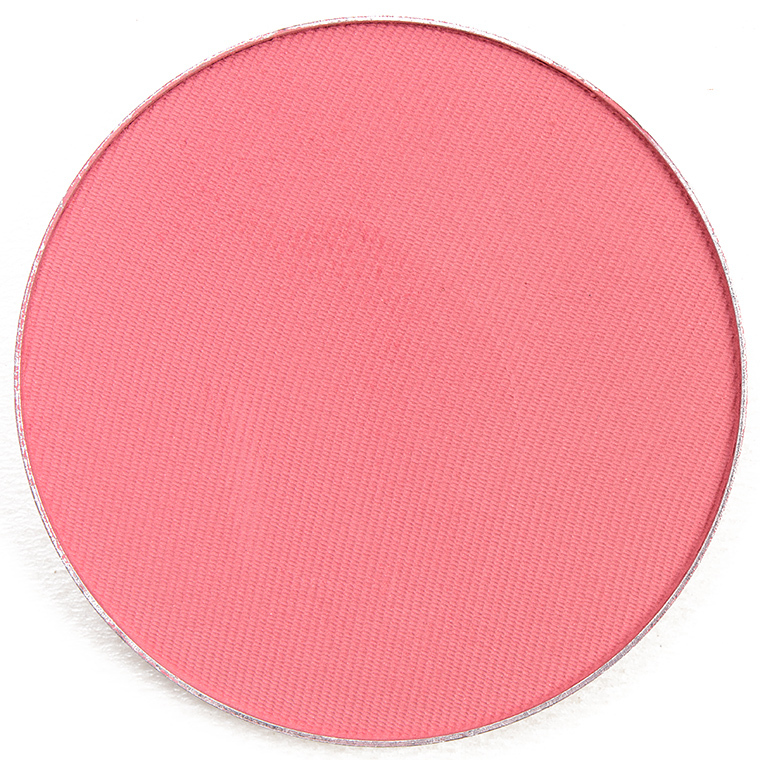 is a vibrant, medium-dark pink with subtle, warm undertones and a mostly matte finish. It was richly pigmented with a soft, velvety texture that was more substantial than most of the brand’s more matte finishes, though this shade was technically a satin (which read more “natural matte” on my skin). 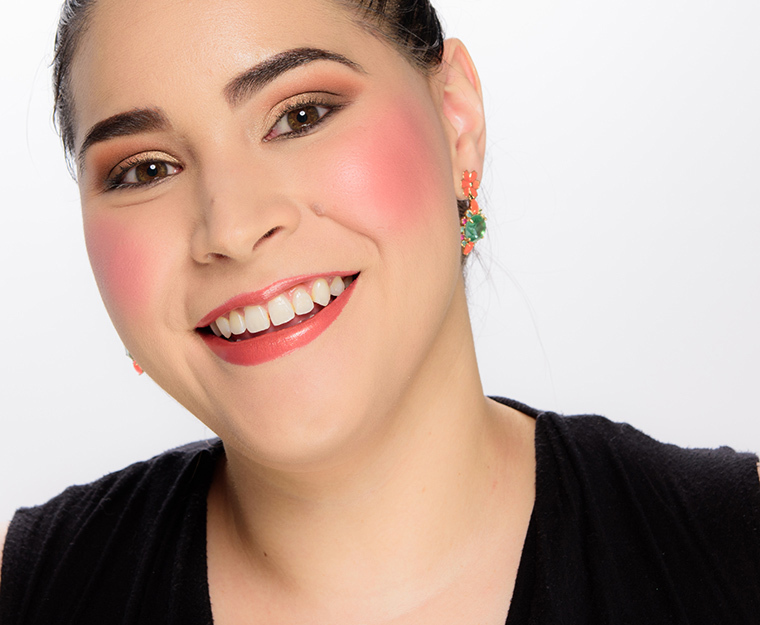 The intense blush applied evenly to bare skin and blended out well with minimal effort. It stayed on well for eight and a half hours. Jouer Kiss Me (PiP, ) is lighter, cooler (95% similar). 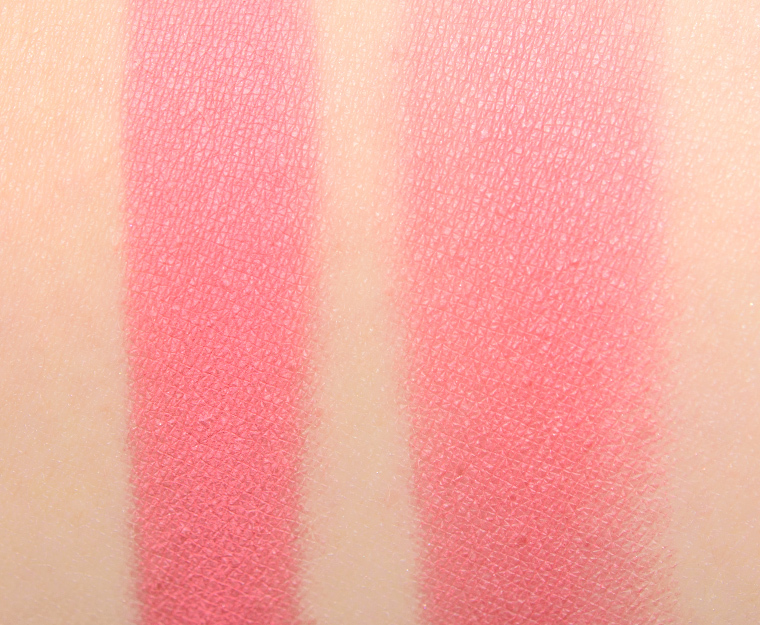 NARS Hot Pursuit (LE, $30.00) is more muted (95% similar). MAC Hipness (LE, $24.00) is less shimmery (95% similar). Chanel Crescendo (250) (LE, $45.00) is lighter (95% similar). Too Faced So Peachy (P, $30.00) is more shimmery, lighter (95% similar). Tarte Deco (LE, $29.00) is cooler (95% similar). NYX Rose Garden (DC, $5.00) is warmer (95% similar). Tarte Fearless (P, $29.00) is darker, brighter, cooler (95% similar). NYX Summer Peach (DC, $5.00) is lighter, warmer (95% similar). Too Faced How Deep is Your Love? (P, $26.00) is warmer (90% similar). Per the brand, the formula is supposed to "provide fantastic colour with ease and consistency" that "applies evenly, adheres lightly to skin." There are five distinct finishes within the range: Frost ("iridescent, lightly shimmering color"), Matte ("flat, matte finish... builds well"), Satin ("adds subtle highlights to the skin"), Sheertone ("sheer-on micro-refined powder ... that goes on faint"), and Sheertone Shimmer ("just enough shimmer to make light dance on your cheeks"). Their permanent blushes are available in compact form as well as pan-only (the latter will be cheaper). The following overview has been updated to reflect the most current iteration of the brand's permanent range (whether or not there's been any official change) as I repurchased the majority of the permanent shades as of June 2018. I make a point to say that because I felt that the textures of several shades, particularly the frost finish shades, was noticeably different; they were much smoother and had more slip but were less shimmery/frosted (on average) and seemed to be a bit weaker in pigmentation (but still buildable). Some of the mattes felt like I've encountered in the past (a little drier, pigmented, and fairly blendable), while some felt more velvety and finely-milled. 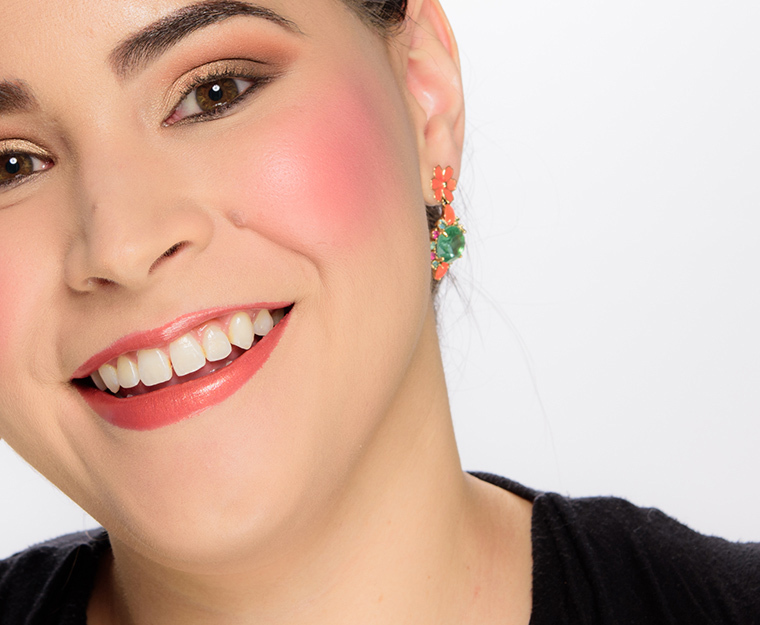 MAC has a solid blush range but some shades are harder than others to blend out or diffuse, and as it does for most formulas (from any brand), it really comes down to some shades falling shy of expectations. The matte finish had a tendency to darken on my skin within five minutes of application; for most shades, I would recommend applying over a powdered face and/or avoiding applying on still-drying complexion products to make blending the easiest. The matte shades seemed to be semi-opaque to opaque, buildable, and long-wearing (about eight hours). Only a few of the shades in the permanent range seemed to be particularly frosted/metallic on the skin; most shades that had shimmer appeared more softly luminous or pearlescent on the skin to the point where there was little sheen/reflection captured by my camera (I did a double take for a few and re-did swatches only to find the same finish captured yet again!). The Sheertone Shimmer performed most consistently with this: very subtle sheen, more "my skin but better" with having a slightly more noticeable sheen than matte. There were a few shades that had a strong sheen on the skin (like Peachykeen), though. The Frost finish just seemed to have stronger, larger shimmer in it, but the effect on the skin ranged being subtle to moderate. The same was true with Satin--some were more satin-like and some seemed more like a Frost (like Modern Mandarin). Most shades were blendable, while pigmentation varied from sheer to opaque depending on the shade, but most had decent, builable coverage. The textures were firmer than the average powder blush of current times, but they don't have excess product kicked up in the pan at all. The wear ranged between seven and nine hours with deeper, intense mattes (like Fever or Film Noir) lasted longer. 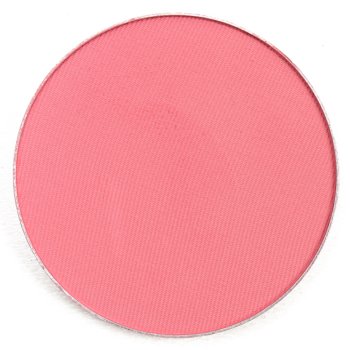 Browse all of our MAC Powder Blush swatches. MAC Fleur Power $24.00/0.21 OZ. Oh no! Even though I have none of the dupes, I don’t need another blush in my stash right now. I really, really don’t. But this one…sooooooo pretty and so perfect for me. And it earned an “A” rating. And it even has a cute name! Look away, Seraphine, look away! Thanks, Christine. This is how my dog must feel when we’re on a walk and he spots a squirrel. I’m the same way about everything Coral! Because I waited too long, and missed out on the 2 Nyx dupes, I am definitely not going to do the same with this! This has a lovely, yet subtle warmth to it that would make it a perfect pink for my coloring. Which is why I was forever eyeballing Nyx’s Summer Peach and Rose Garden. Fleur Power will be mine! 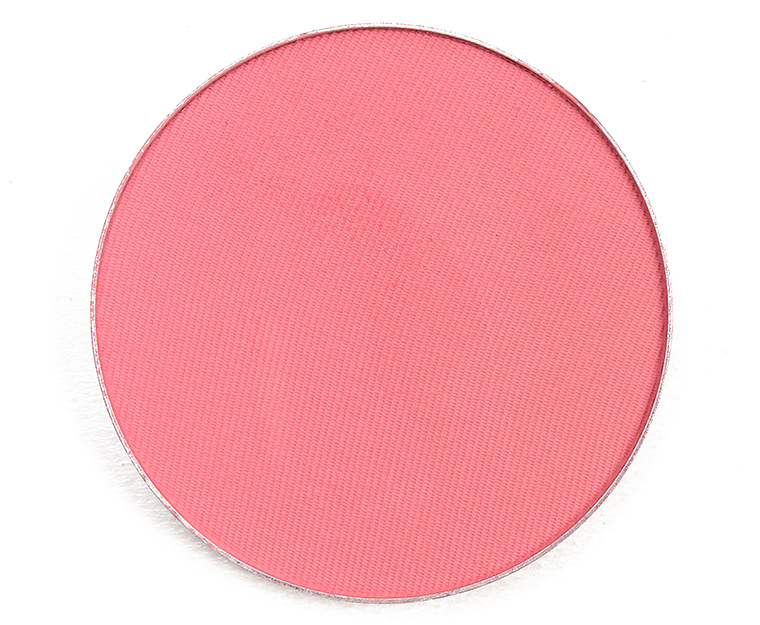 This blush is so pretty. I remember a Mac MUA putting this color on me years ago, & I bought it. I don’t have it now. Moved so many times since then. Maybe, it got lost. I want this just for the name, hihi.